I’ve been buying natural and organic products for years. Here are the top 10 reasons I buy organic food and personal care. Funny but true: Our families think my husband and I are vegetarian. From uncles asking if I eat meat to my brother-in-law buying veggie patties, we’ve earned the reputation of being vegetarian. While we’re not vegetarian, we do shop at farmers markets and buy organic, which might have given the impression we also avoid meat and who knows what else our families may think. I didn’t always start out this way. Only in my 20s and 30s did I read books and watch documentaries about sustainable food. I then began learning more about buying natural and organic products, from makeup to toothpaste to household cleaners. The biggest catalyst came when I was pregnant with my eldest. I was the pregnant lady who didn’t want chemicals in her body, and for good reason. Nothing like pregnancy makes you more aware of what you eat and put on yourself, and how it will affect the growing person inside you. One of the stores that always carries natural and organic products is my local Sprouts. You’re pretty much going to walk out of there with products that have your best health in mind. They have a huge section for natural health care, from tea, vitamins, beauty items and toiletries. 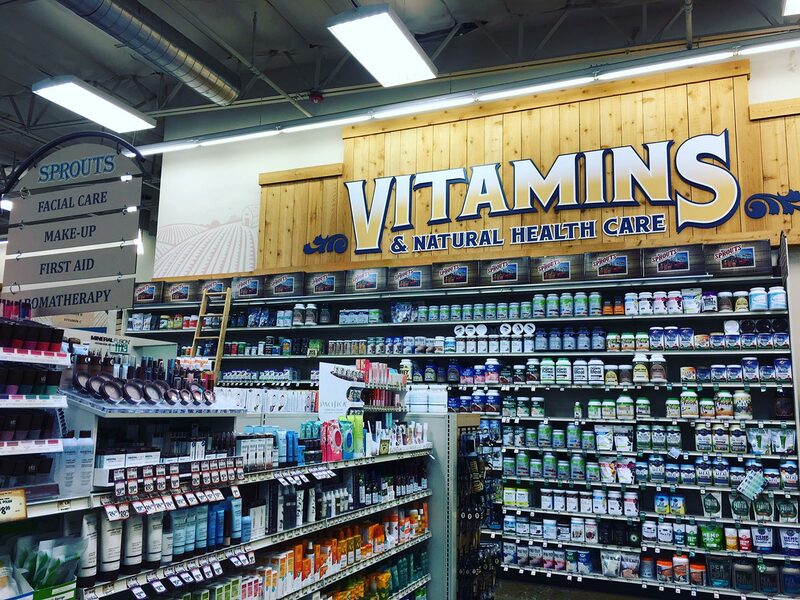 Sprouts includes a huge selection of natural health care products. Want to check it out in person? Find a Sprouts near you! At Sprouts, you know you’re making a good purchase and can rest assured they carry items that match your values. 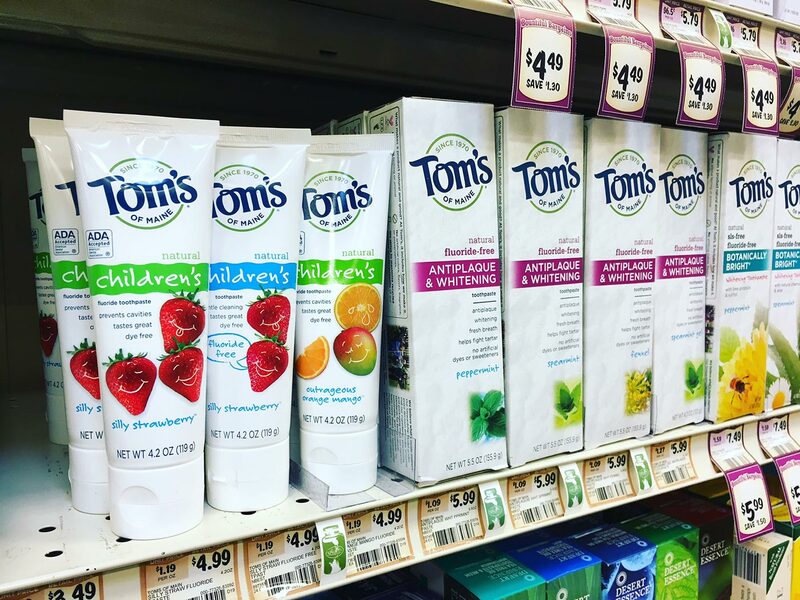 Tom’s of Maine carries a wide variety of products for both adults and children. What we do to our bodies now can affect how well we live years down the line. It can be hard to justify paying more for natural and organic products, but think of it as preventative medicine. 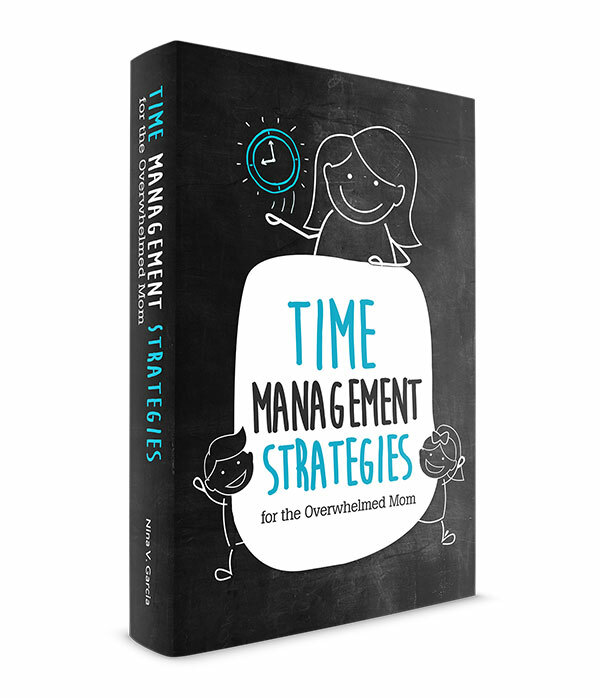 Taking care of our bodies now helps avoid complications and illnesses that can come up later. Many natural and organic products are made with sustainability in mind. Other products sell for less because they don’t consider the costs of producing their items. Tom’s of Maine has high standards for sustainability. They use plant-based resources and reduce waste through recycling and biodegradability. They also promote the use of sustainable growing and harvesting practices. The way we spend reflects our values. We vote with our dollars, so every purchase for products that value our well-being is a way to support those businesses. In buying these products, we help them continue to create these items. And you don’t have to overhaul your life, either. Little by little, one purchase at a time, can make a huge difference! One of the best ways to support your local community is to shop from small businesses and farmers markets. Each time I make a trip to our Sunday market, I feel good knowing more of the dollars flow right back to my local community. The ingredient list on food packaging shouldn’t contain complicated ingredients, much less a lengthy list of one. Natural and organic products source simple ingredients, often those found in nature. You can rest assured the products you use and food you eat are as close to nature as possible. I love that Tom’s of Maine toothpaste isn’t tested on animals, nor do they use animal ingredients. It’s one more way they create products that work without resorting to animal testing. It’s easy to overlook what it takes to produce and distribute products on a massive scale. 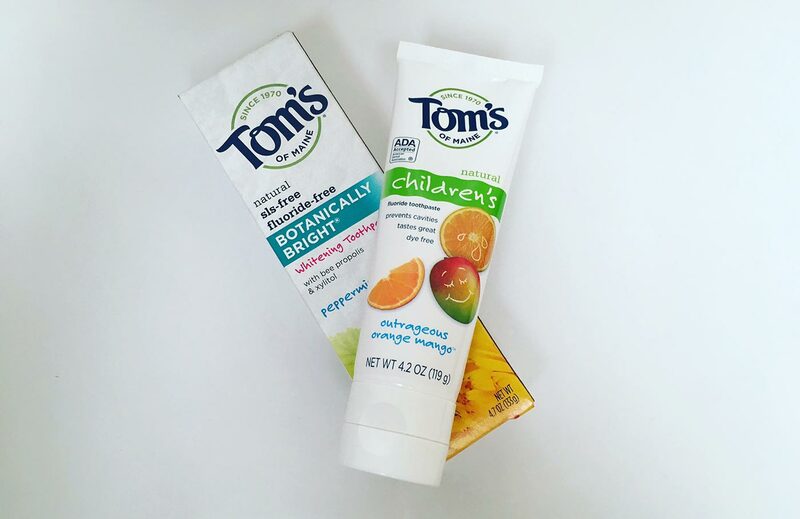 Companies like Tom’s of Maine deliver high-value products while sourcing from suppliers that promote basic human rights. My son is passionate about the environment. He’s been reusing old scraps of paper, asking about landfills, and planting seeds in the soil. And while I don’t take credit for his interests, it’s also no surprise kids pick up on our behaviors. 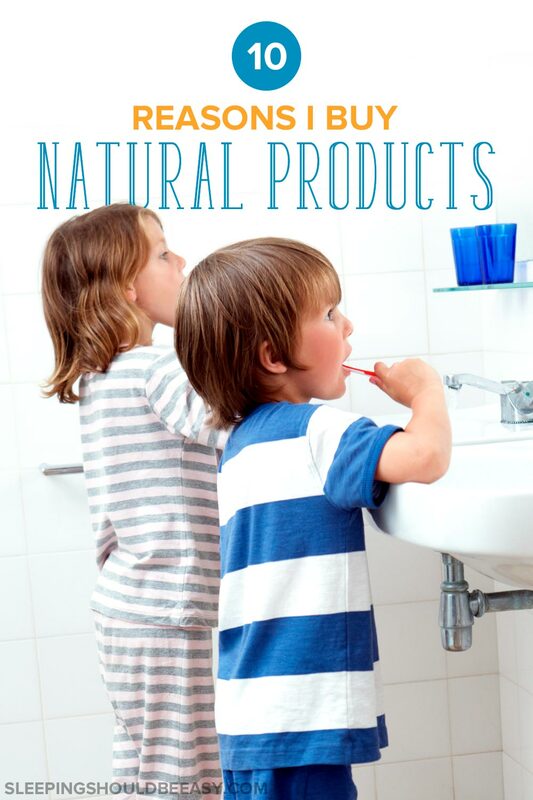 Buying natural and organic products is yet another way parents model values through example. Kids learn the importance of taking care of our bodies and environment all by watching what we do. As someone who was careful about food and personal care products from pregnancy, I want to start my kids off on the right path. I know we can’t control their outcomes, especially with so many factors in play. But I’d like to think I’m helping them grow as healthy as possible by starting now. The food and personal care products we consume can make an impact on how they grow and develop. And buying natural and organic products is a good place to start. I’d love for you to learn more about Tom’s of Maine, their products and vision. Visit Toms of Maine’s website for more information. Oh I’m so glad you’ve heard of them now! They’re a fantastic brand and make all sorts of personal care products. And that’s awesome you’re making your own juices, wow! I recently made a detox smoothie and was seriously impressed that it tasted so good but was completely fruit and vegetable-based.